Appearances and presentations are what it's all about for Kirsten and I. We love to share our passion. Every fly fisher who has joined us at a fly-club presentation or has attended one of the many shows or fairs sees that we are energized about this great sport. The presentations are a great way to receive accurate and detailed information about a piece of water. Kirsten and I have a ball at all of these events and we look forward to each and every one. At the right is a list of upcoming events that we will be involved with. We hope you enjoy these great presentations. Handouts are included for all presentations. Handouts include but not limited to; maps, equipment needed, fly choice and special rigging information. All handouts will be made available on this page for a limited time after the presentation. This is our newest and I believe our best presentation. Streamer fishing has become a tactic that recently has been pigeon holed only for big nasty fish; which is bad, because all fish of every size eat streamers. Fish eat other fish. It is the way their world works. They also eat sculpins, crayfish, tadpoles and other big protein meals. We cover the latest in streamer tactics, equipment, rigging and flies. We also breakdown water and match the tactic need for that water. We will have the equipment at the presentation for fly club members to get hands on experience. This presentation is animated for the audience to enjoy and to fully understand the what, how and why of streamer fishing. This new presentation is based on over twenty five years of fishing or guiding the “Hex” at Lake Almanor. This great fishery offers anglers a chance to catch big trophy trout on biggest Mayfly. A great way to spend an evening fishing on the lake. The presentation will illustrate how to breakdown the lake to fish, flies, rigging and personal safety while fishing this large impoundment. This presentation on the “Hex Hatch” is a great avenue to get solid updated information on the lake and the “Hex”. This presentation is 100% different than all of our others. The audience has hands on interaction with this class / presentation. We simple show you how to breakdown still water, where to look for the transition zones and pick which weapon out of your tool bag to use to get to the fish to eat. The tactics and how to breakdown the lakes can be used for every lake. This is an animated presentation. A great new concept in providing fly fishers the information they need. This is our newest presentation. Like “Breaking Down Stillwater I”, this program is animated. We review Part I, and then we take set situation from Part I and go over how and what we would fish with. Covering positioning of the boat, tactics, flies, rigging and retrieves. The audience is involved in demonstrations. It’s probably the best presentation we have going. Lots of hands on knowledge being shared is this program. The Feather River located in Oroville, CA it has a large Fall and Spring run of steelhead. The fishery has been in the news lately due to the wild winter we had in 2017. The river has changed in many ways for the good. The high water has cleaned the slate clean. New spawning gravel has been exposed and side channels have opened up for rearing the small steelhead minnows. The presentation gives a well-rounded view of the river. 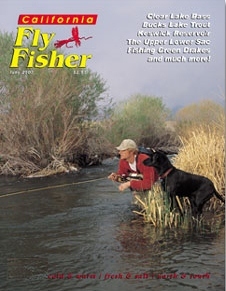 The lecture portion of this presentation covers history, angling information, access points, fly-fishing techniques and flies. Lance will go into the difference of the Fall run verses the Spring run fish and the different tactics we use for targeting these great fish. A totally new presentation. This presentation has a little of everything – an overview of what Northern California has to offer the fly-fisher. The venues include rivers to the beaches; Moss Landing, Yuba River, American River, Feather River, Lower Sac, Lake Almanor, East Park Res, Lassen Park and the little Spaniard creek called Putah Creek. Northern California has many types of fish to cast a fly too. Steelhead, trout, shad, stripers, surf perch, bass, rock fish and halibut are represented in these presentations. We mix and match for areas and club desires. A great program. “Angling the Lower Sacramento” is, of course, a presentation on the Lower Sacramento River. It's more than showing off the grip-and-grins photo of the big wild rainbows and steelhead. It's not about drifting the river, per se (although drifting is covered). The presentation focuses on precisely what an angler needs and the locations of access areas for wading anglers and boat launches for those who drift. The presentation will educate the fly fisher on the entire Lower Sac. In 2017 the Lower Sac was scrubbed cleaned by the huge high water reaching 85,000cfs. The river has changed. Riffles have been added and runs that were constant have moved around. Fishing is great – but she all different. The Lassen National Volcanic Park is a fly fishers dream. Concealed within its boundaries are legendary waters like Manzanita Lake and the headwaters of Hat Creek. There is no fish planting schedule for the park, only wild fish are found. The presentation will focus on a variety of fisheries including both still water and freestone streams. Both back packers to car top angling will be covered. Equipment and techniques, including Tenkara are highlighted and discussed during the presentation. On March 13, 2019 I will be at the Delta Fly Fishers in Stockton doing a presentation on the"Fab Four". This presentation highlights the great bass fisheries we have on the west side of the Sacromento Valley. Start time is 7:30pm. For more information please look at the Delta Fly Fishers website below. On April 10, 2019 I will be at the Shasta Trinity Fly Fishers doing a presentation on Streamers. The meeting is held at there new clubhouse in Redding. The presentation starts at 6:30pm. May 7, 2019 I will be at the California Fly Fishers Untied in Sacramento doing a great presentation on Streamer Fishing. Please if you are in the area come by and see the presentation it starts at 6:30pm. On August 1, 2019 I will be in Fresno at the Fresno Fly Fishers. I will be doing a presentation and tying at the club. The meeting will be at 550 W Shaw Ave in Fresno the meeting starts at 7:00. Please come by and see us at the club. On October 15-16, 2019 Kirsten & I will be in Sourthern Oregon doing presentations back to back at the Southern Oregon Fly Fishers﻿ on Tuesday the 15 in Grants Pass and on Wedensday the 16 we will be at the Rogue Flyfishers﻿ in Medford. This is really cool. Back in the early 80's I was living in Medford and as a kid I went to the Rogue Flyfishers meetings. At the time they where held at my Junior High - Hedrick. Junior High. The meetings start at 6:30. For more information on the clubs. Here are there links.